Today “Statistics Netherlands” and the Dutch Minister of Infrastructure and the Environment announced the latest figures for traffic deaths in the Netherlands. Cyclists in Houten. The safety for cyclists increases every year in the Netherlands. The minister writes in her letter to the Tweede Kamer (the Lower House of Parliament): “With these figures the Netherlands holds its position in the leading group of the safest countries in Europe. Regarding the percentage of decline: this is in line with other countries for which figures for 2010 are known at the moment (on average 10% lower than 2009). It should be noted that the number of deaths per 100,000 inhabitants in the Netherlands is considerably lower than in most other countries. This adds additional weight to the decrease in 2010.” There is however, also a down side to the positive figures: ”There was a notable slight rise in the number of pedestrians killed in 2010: 72 pedestrians died, of whom over 60 percent were aged 50 years or older. Pedestrians were the only group of road users for whom the number of deaths did not decrease.” In a reaction the ANWB (motorists organisation) called for a separate investigation into the reasons of the increase of the number of deaths for this vulnerable group of traffic users for which there is no apparent cause. And the spokesperson feels the country should do even better: “The goal is to decrease the number of deaths to 500 in 2020. But we feel it is possible to go further than that, a decrease of 50% in 10 years. So from 640 deaths in 2010 to 320 in 2020”. In her letter the minister also notes that she “brings this message with mixed feelings, as 640 deaths still mean a great deal of sorrow”. But still it is good news that the number of especially younger and older cyclists decreased significantly. The footnotes to this table reveal more interesting facts: For the over 65 year old cyclists: “This decrease seems in line with the average decrease figure, but this age group grew 3% compared to 0.5% for the whole population so the figure is actually better than it seems.” And for cyclists in general: “In 2010, 4 cyclists were killed in right hook incidents with a truck. In 2009 this figure was 10.” To be perfectly clear: that is the number for the whole country in the entire year. 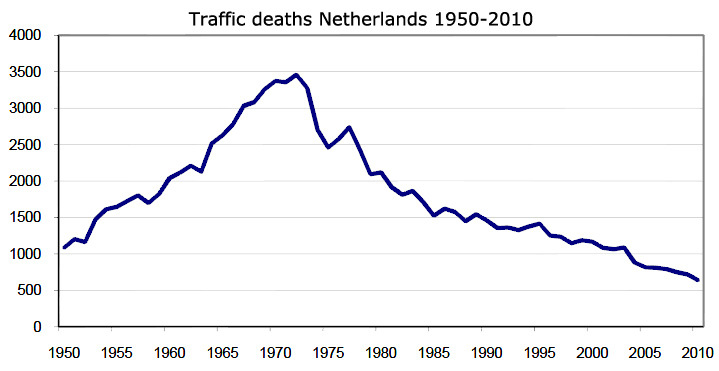 60 years of road deaths figures for the Netherlands. Today there are less deaths than in 1950 even though the population grew from 10 million in 1950 to 16.5 million in 2010 and mobility grew exponentially. Statistics Netherlands has one final remark: “The number of fatal casualties on Dutch roads has been decreasing since the mid-1970s, when more than 3 thousand people a year were killed in traffic accidents. (..). Since the year with the highest number of traffic deaths, 1972, the number of people killed yearly has fallen by 80 percent.” In 1972 the Dutch population was 13 million compared to 16.5 million in 2010. Looking at all the information it cannot be a coincidence that from the mid 1970s the people of the Netherlands stood up for the most vulnerable road users and separate bicycle infrastructure slowly became the norm. Update: 19 April 22:00 hrs CET. This post, written by me, was first published on the blog ‘A view from the cycle path’ on Tuesday 19th April 2011. 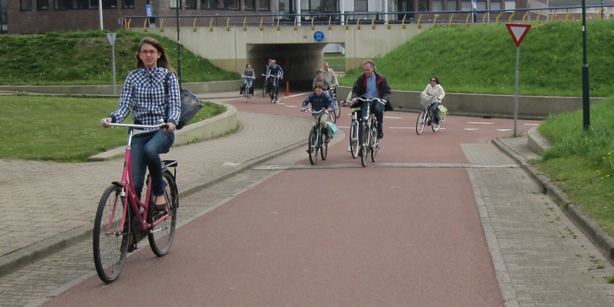 This entry was posted on 19 April 2011 by Bicycle Dutch in Original posts and tagged figures, sustainable safety.